Tamil is written in the following scripts: Tamil, Arabic, Tamil Grantha and Roman. It can also transliterated into Devanagari script in Unicode. Curiously enough we find a copper-plate grant containing an inscription having Sanskrit and Tamil sections both written in the Grantha script . The date of the record falls in 1289 AD. The Tamil portion is entirely transliterated in Grantha script following only the written form and *not* the form of pronunciation. Dr. K. G. Krishnan (Dept. of Epigraphy, Mysore, India)- Indo-Iranian Journal, 1972). The Grantha script is what gave rise to both the modern Tamil and Malayalam scripts. one on the East coast (Tamil Nadu) and another on the West coast (Kerala).
" Another line of development is reflected in the Chera and Pallava scripts of South India, dating from fifth to eighth centuries CE. This eventually took the form of the Grantha script (from a Sanskrit word meaning 'book'), which predominated especially in the Madras area. 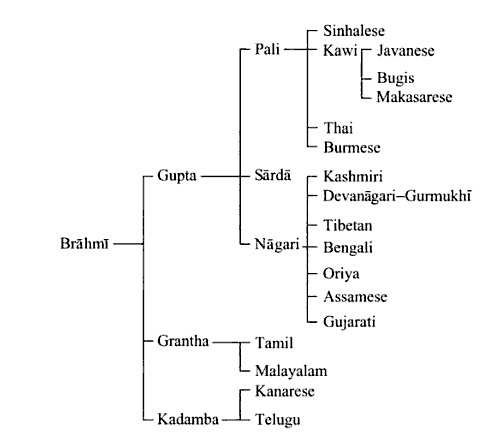 A Western variety of Grantha is the ancestor of the modern Malayalam system, and an eastern variety of Grantha was formerly used to write Tamil." The great Tamil alphabet occupies the extreme south of India." pg. 349 has the entry on Malayalam language. Of particular interest is the fact that Malayalam is also written using Tamil Grantha script. "The earliest record of the language is an inscription dated to AD c. 830. An early extensive influx of Sanskrit words influenced the Malayalam script (derived from the Grantha script, itself derived from Brahmi): it has letters to represent all the Sanskrit sounds, besides the Dravidian sounds. The language also uses a script called Kolezhuttu (Rod script), which is derived from the Tamil writing system. The Tamil Grantha script is used as well." Some social factors that Dravidian letters came to be written inside Grantha script are described by prof. S. N. Sadasivan that may be of interest. or spherical writing) of Njanamonam which was the contribution of Buddhists. Between the 3rd century AD and the 9th century, Vattezuttu was the only alphabet and even in the early part of the 19th century, it was used for official records. By the 15th century, another script came into vogue, the Kolezuttu (long script) which however could not replace the Vattezuttu nor could it become popular. A third group of letters the Grantha-lipi (book script) was said to have been introduced at the instance of the Btrhamins because they wanted to dissociate from the Buddhist Vattezuttu and the later Kolezuttu obviously of non-Brahmin origin. Tamil Grantha is a script capable of writing both Dravidian (Tamil, Malayalam, ...) and Indo-Aryan (Sanskrit, Prakrit, ...) languages. For the Grantha being used for early Malayalam - a Dravidian language -, old Latin book (1772) Alphabetum grandonico-malabaricum sive samscrudonicum. Clemente, di Gesù; Giovanni Cristoforo Amaduzzi, 1772 Latin Book xxviii, 100 p. viii fold. pl. 19 cm. P. Visalakshy, The Grantha script, Dravidian Linguistics Association, St. Xavier's College, University of Kerala, 2003.
" Considering the shape of letters, Grantha script can be classified into two varieties, the square and the round, The square variety was more popular among the Hindus and the round variety among the Jains of Arcot and Chennai regions. The famous work 'Alphabetum Grondonico Malabaricum' printed in 1772 in the Polyglot Press, Rome is in the Grantha script and the letters of this work are of the square variety. Depending upon the geographical variations, the Grantha script can be broadly classified into four types: the Pallava, the Cola, the Pandya and the Tulu-Malayalam."